Q. What is the chief and highest end of man? There are four means that God has ordained to grow His Church. They are, Evangelism (sharing the gospel), Discipleship (training and teaching the new believer) Service, (Helping the hurting and dying world) and persecution. 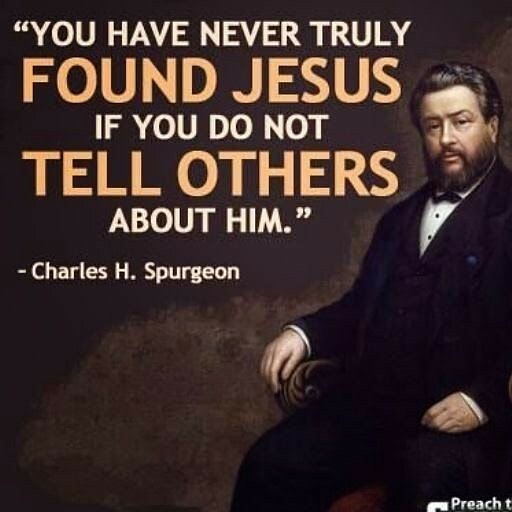 People only become converted from hearing and responding to the gospel. They grow closer to God, and get to know Him by reading His word, and learning His truth. The new heart and nature of a convert is on display in the world humbly serving the lost and dying, displaying the glory of God. Persecution weeds out the false converts, and demonstrates another truth, the world hated Christ, and they will hate you also for His namesake. The exclusivity of the cross is offensive to the world. Remember persecution comes from outside the Church. Who goes to Church, and why? This is important to figure out, if you are concerned that your congregation is dying. One category of people is false converts. Some of them know they are not Christian, some believe they are Christians. Lost people have a few reasons why they go to Church. Of those reasons, none of them are the right ones. They go to Church to get a pep talk, a self-help speech, they go for professional and social networking, they go to feel good about themselves, (self-righteousness) they go to be entertained by a slick, “praise/worship band. We can agree that these are not the right reasons to go to Church. So what are? If you are a true convert, you know your purpose in life is to bring glory to the Lord of salvation. You’ve been brought to new life by grace, through faith. You were dead in your trespasses and sins. You know you were purchased at a price, and the Lord of Creation suffered humiliation and death on a cross, in your place because of your sins. Christ became sin for you. You come to Church because it is God’s will. From your new nature you want to do God’s will. After all, He is changing your desires and affections by the power of the Holy Spirit, and the reading of His word. Our minds are being renewed so we can prove what the will of God is, that which is good and acceptable and perfect. You come to be with brothers and sisters in Christ, to hear the word of God expositorily preached, to sing praises to God, to worship Him in prayer, and song, to be baptized, and have communion, and to be sanctified by God in learning to live in community with other sinners, and by granting them grace, to live out the gospel for the glory of the Lord. Who is church for, the goats or the sheep? Church is ultimately for the glory of God, and that glory is for our good. God says, “But seek first His kingdom and His righteousness, and all these things will be added to you. Church is for the sheep. They are the ones who really want to go for the right reasons. When God says in Matthew 16, “…I will build my Church…” we also see the means He has ordained for the growth. He is going to use us to preach the gospel to the lost and dying world, because the gospel is the power of God unto salvation. Salvation is of the Lord. It originates with Him. It is provided by Him. Jonathan Edwards once said, “You contribute nothing to your salvation except the sin that made it necessary.” Even persecution is given for the growth of the Church. If there are false converts in the local body, when persecution comes, they will flee, and deny Christ. The truly converted will stay, and proclaim the gospel, and make disciples even during persecution. What is the gospel? Simply put, “Repent of your sins, believe on the Lord Jesus Christ.” We have to unpack that for sure. It shouldn’t be a daunting task for us. It should be something that overflows from the heart of a believer, as they have experienced the love and grace of Jesus. While we were yet sinners Christ died for us. Most people don’t share it, because they are woefully ignorant of what it is. Here is a simple analogy. Imagine you are a telling a class full of students who want to become mechanics that you are a mechanic, but you leave out the fact that you don’t understand how an engine works. Then when the students ask you how the engine works you mumble and string together things you’ve heard mechanics say. You wouldn’t feel very comfortable or sure of yourself would you? Believers should feel confident and comfortable sharing the gospel. It is imperative that they learn how to do so, and that they do it. People are entering eternity without Christ. They will rise to eternal torment and burning, having the very wrath of God poured out on them. How can we say we have love, if we refuse to give them the gospel? Friendship evangelism is impractical. The Christian should have a fervent urgency to share the gospel with the lost so they can be saved. Friendship evangelism is slow, and you can only befriend so many people at a time. The need is great, and the workers are few. The command is not to preach to a few, but to all, and we need to get busy. Don’t compromise on the gospel. If we soften the gospel to make it more appealing to the lost, we rob it of its effectiveness. If it were readily acceptable to the reprobate sinner, it is because it doesn’t require rebirth for him to believe it. The only way to grow the true church is by the means that God has ordained evangelism, discipleship, service, and persecution. What needs to happen so we can do this? Free up Elders who are gifted and able to preach and teach the gospel to the laymen, and to teach them how to evangelize. Organize them, to go out and evangelize. When people are converted they will look for a Church. It doesn’t matter if you put more people in the seats at your Church. We don’t do this to grow our kingdoms, but rather the kingdom of God. New converts will come in. When they do, be ready to teach them from God’s word. Don’t feed them cotton candy theology, sermonettes, or topical sermons that are more self-help than the word of God. Take your position in the pulpit seriously. Get them grounded in God’s word because when persecution comes they will need to know the hows and whys of it. Get them out there serving the lost and dying world out of the new love they have in their hearts. Equip them to go out and share the glorious gospel of Jesus Christ. The Systematic Theology Study Bible from Crossway, in E.S.V. Black Genuine Leather, and the Hardcover Edition.